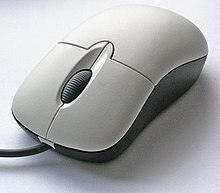 In computing, an input device is computer hardware which is used to enter data for processing. Examples of input devices include keyboard, mouse, image scanner, digital cameras and joysticks. A touchscreen is a combined input and output device. ↑ Doyle, Stephen (2010). Essential GCSE ICT for AQA: Student Book. Oxford University Press. p. 4, 303. ISBN 9781850085430. ↑ GCSE ICT (Information Communication Technology): Complete Revision and Practice. Coordination Group Publications. 2003. p. 13. ISBN 9781841463766. ↑ 3.0 3.1 "Input device". Computer Hope. Retrieved 2011-09-11. This page was last changed on 20 May 2018, at 21:35.